We woke up early on our final day in Kyoto. 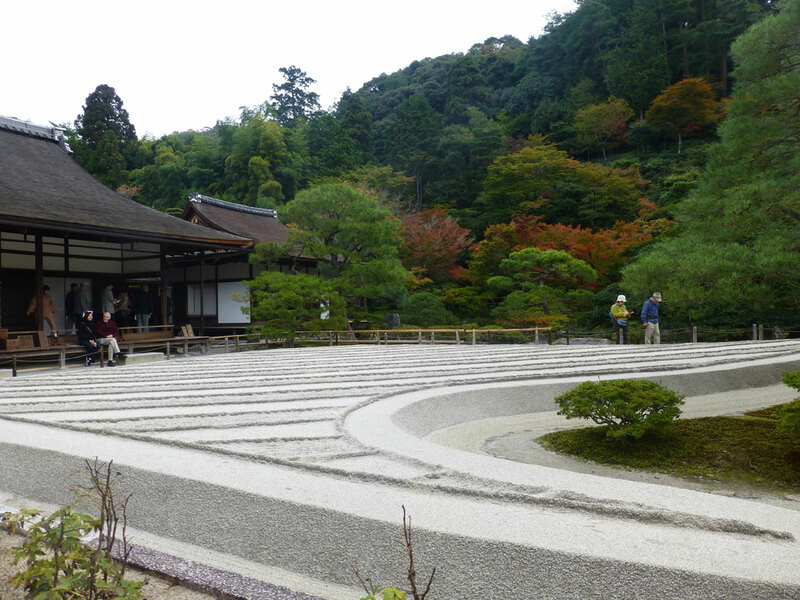 The Lonely Planet guidebook suggested arriving at Ginkaku-ji as soon as it opened to avoid the crowds. We hopped on the #100 bus at Kyoto Station, which I’d wished we’d taken on our first day as it was essentially a 230 yen tour bus. It carried us past the massive orange torii at Heian Shrine and five other must-see sights. It was also a subtle reminder that three days in Kyoto wasn’t nearly enough. After rubbing shoulders with thousands of our closest friends over the previous couple days, arriving at Ginkaku-ji before the crowds was simply amazing. You could get the sense of what it would have been like to walk the grounds before it became a tourist attraction. With only a handful of people inside, our ears rang with silence and tranquility. The temple, officially known as Jishō-ji, was built as a retirement villa for shogun Ashikaga Yoshimasa in the late 1400s. Ashikaga’s grandfather had commissioned the golden pavilion of Kinkaku-ji and Jishō-ji was intended to resemble that pavilion, including a silver-foil facade. However, the Ōnin War delayed construction and Ashikaga died before the silver foil could be applied. 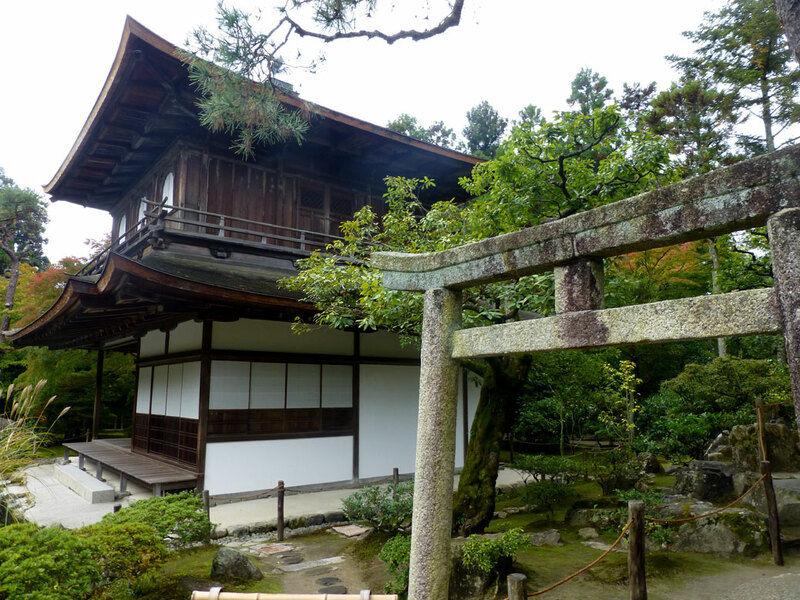 The common name Kinkaku-ji (“Temple of the Silver Pavilion”) became a popular nickname in the 1600s. The stellar gardens are highlighted by two meticulously maintained sand sculptures. The first sits in front of the pavilion itself. 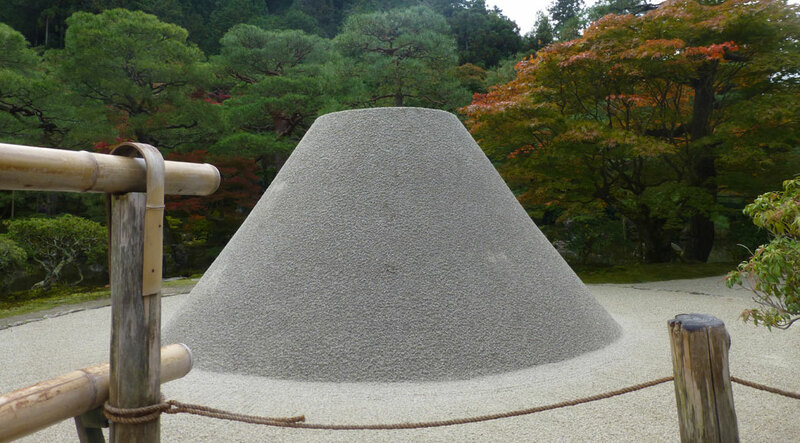 The sand formed into a four-foot tall homage to the sacred Mt. Fuji. Sitting on the veranda of the residence, you can gaze over the second sand garden with its sharp curves and lines. A maintenance man was straightening the sculptured sand before the crowds arrived with the precision of a surgeon. The temple path leads up into the surrounding hills. From one overlook, you can see a Chinese parasol tree growing in the distance. In 2011, a seedling from a tree in Hiroshima that survived the atomic bomb during World War II was planted on the hillside. 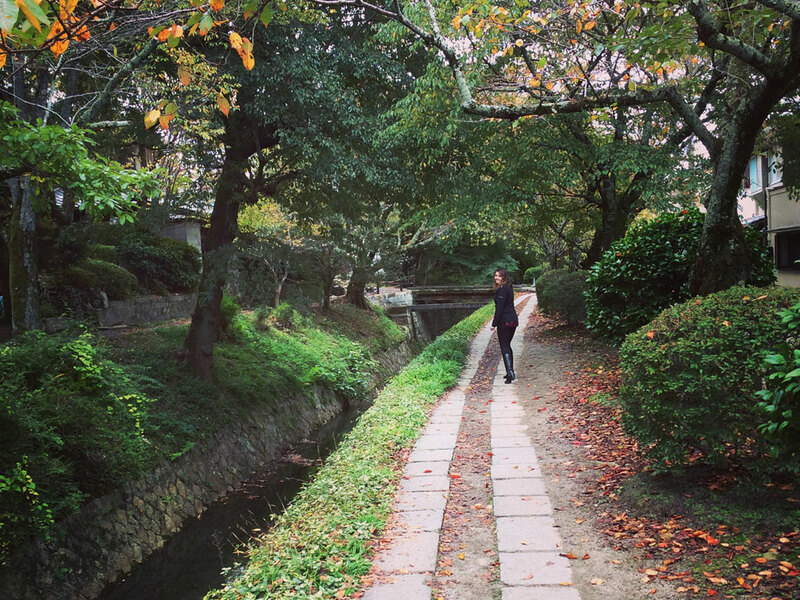 From Kinkaku-ji, we headed down the Philosopher’s Path, a two-kilometer walk along a cherry tree-lined canal leading to Nanzen-ji temple. The path was named for Japanese philosopher Nishida Kitaro who would follow the path on his daily walk to Kyoto University. The surrounding neighborhood mixes residences with small cafes, giving it more of a European feel. We arrived at Nanzen-ji, our last stop before heading home. The massive sanmon (main gate) welcomes you into the surprisingly large grounds. 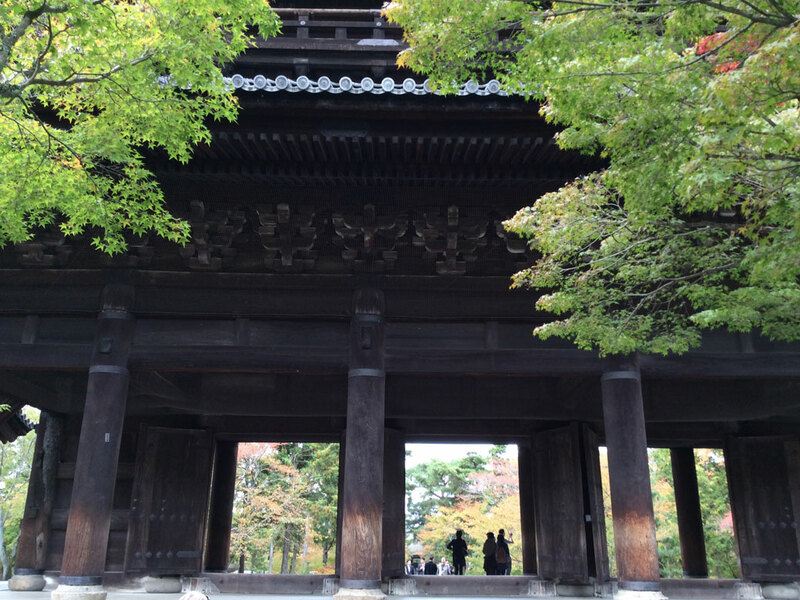 The temple was established in the late 1200s and buildings seem to sprout from the surrounding trees. The most impressive of all of the temple’s structures was the long, arching aqueduct. 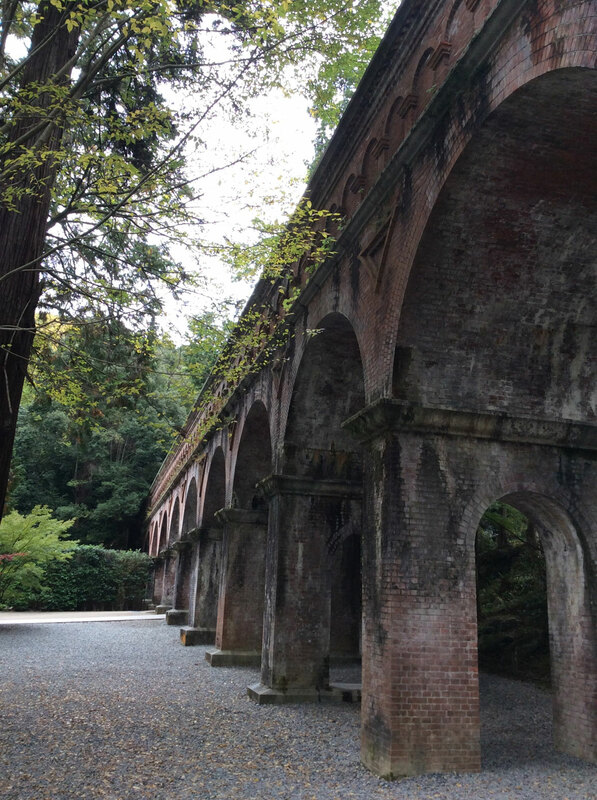 It was built in the 1800s to provide water from Lake Biwa west to Kyoto. It looked out of place amongst the traditional eastern architecture, but the curves of the arches provided several foolproof photo opportunities. With that, our unforgettable Kansai trip came to an end. We boarded the Shinkansen for Tokyo Station and returned to real life. Great place! Can´t wait to be there in December! There’s so much to see! If you have time, Osaka is an easy day trip (45 minutes by express train) from Kyoto.